Youth in grades 8-12 are invited to join the Youth Ministry. For information, contact Ann Severance at youth@sjmp.org. The next Youth Ministry event will be Pizza and Prayer on Sunday, January 29 from 4:00 - 6:00 PM. Come and pray in the traditions of St. Francis of Assisi, St. Ignatius, St. Patrick, and St. Paul of the Cross. Prayer will be held in the church, followed by pizza and fellowship downstairs. You are welcome to bring a friend. To RSVP, email youth@sjmp.org. In October 2016, Youth Ministry members journeyed to the Bon Secours Retreat and Conference Center in Marriottsville to walk and pray on the labyrinth. A labyrinth is not a maze, but a path to follow into a center place and then back out again. Participants prayed in silence as they walked the path. Each participant finished by making a finger labyrinth to be used during personal prayer time. The group then walked to the Centennial Peace Garden to pray, and took a walk around the pond to see the beautiful grounds of the retreat center. 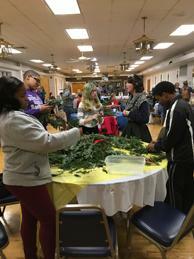 In November 2016, Youth Ministry members participated in the parish's advent wreath making event. 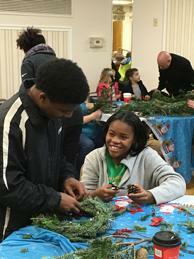 After making a wreath for their own families, they also made 10 additional wreaths, which were delivered to homebound parishioners. The Youth Ministry members also wrote Christmas cards to these homebound parishioners following the Service of Lessons and Carols program in December. They also served as greeters and handed out programs at the service.